It's hard to picture Boies Schiller Flexner without David Boies and Jonathan Schiller. But on Wednesday, the 320-lawyer litigation powerhouse announced a major step to prepare for that eventuality. No one is concerned anymore about, say, Cravath, Swaine & Moore without Paul Cravath or Kirkland & Ellis without Weymouth Kirkland. But Boies Schiller Flexner without David Boies? Without Jonathan Schiller? How is that going to work? On Wednesday, the litigation powerhouse announced a major step to position itself for that eventuality, creating a four-member management committee that will assume the two name partners’ administrative duties. Karen Dunn, Nick Gravante, Phil Korologos and Damien Marshall will divide responsibility for areas including salaries and draws, billing rates, recruiting, accounts receivable, alternative fee arrangements, conflicts, diversity, expenses, IT and pro bono. Bill Isaacson will serve as vice chairman of the firm. The changes will officially go into effect at the firm’s annual meeting, to be held Dec. 7-9 in Key Biscayne, Florida. Boies, who is 77, will continue as firm chairman, and both he and Schiller will retain the title of managing partner. And they’ll still be on the executive committee, which in addition to the four management committee members also includes Karen Dyer, Natasha Harrison, Alan Vickery and Steve Zack. Still, it’s less an abrupt change and more of a gradual letting-go. The move comes as Boies seeks to move past harsh criticism for his work on behalf of Harvey Weinstein and failed blood testing company Theranos. His namesake firm is one way to ensure that his legacy endures. “We want to see the culture and the institution continue to grow and expand beyond us,” he said. Even if that means handing the reins over to the next generation. The transition is intended to be seamless for clients, but Uber GC Tony West (whose company also knows a bit about the importance of succession planning) said he’s reassured that the firm is not leaving it to chance. “As one who frequently relies on BSF for advice and guidance in a myriad of areas, it’s comforting to know that they are being smart, deliberate and strategic about the future—preserving those qualities that make BSF unique while also recognizing the need to grow, evolve and innovate,” he said in an email. Transition planning has been a longtime concern for the firm. Boies said they began the process 15 years ago. It’s a marked contrast from the firm’s beginning in 1997—when they launched “by the seat of our pants,” as Boies put it. Faced with an intractable client conflict, Boies left Cravath on a Friday and opened his own firm in Armonk, New York, four days later, initially working out of his wife Mary’s law office. The model they settled on is not typical for a 320-lawyer firm with gross revenue last year of $410 million and profits per equity partner of $3.27 million. That is, the three name partners practiced law full-time, and also ran the firm. They added an executive committee and eventually installed administrative partners in the firm’s 15 offices, but the name partners retained the lion’s share of responsibilities, governing by consensus. 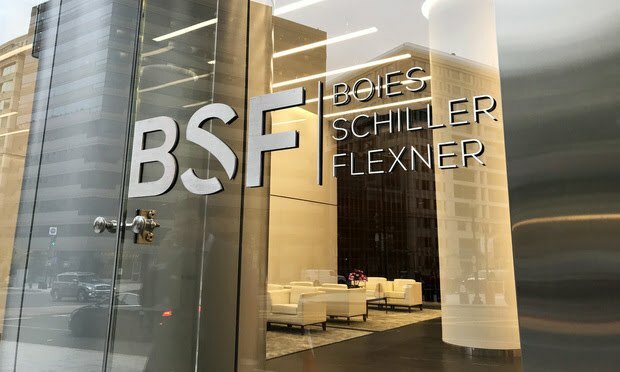 It’s no doubt less efficient than a single, full-time managing partner, but having the firm led by some of its busiest and most successful lawyers is part of the BSF culture. “If David Boies can make time to run a law firm while doing Microsoft or Bush v. Gore, I figure the four of us can do it the same way,” said Gravante, who is based in New York and has a reputation as a major business generator, with clients including more than a dozen Lloyd’s syndicates, Starr Companies, Kushner Companies and HSBC. Other top firm clients include Barclays, Goldman Sachs, American Express, Pimco, Delta, Florida Power & Light, Facebook—and yes, the New York Yankees, whose conflict with Atlanta Braves parent Time Warner Inc. prompted Boies’ exit from Cravath. Executive committee member Natasha Harrison, who heads the firm’s London office, said she appreciates that Boies and Schiller “are not putting in place mini-me’s” to replace them. The management quartet are “truly diverse, and not just in the traditional sense of gender or sexual orientation, but diversity of background,” she said. All four are accomplished litigators, but joined the firm at different points in their careers. Damien Marshall, for example, is a Boies Schiller-ite through and through. He was the first associate hired in the firm’s New York City office 17 years ago. Phil Korologos goes back even further, working at Cravath as an associate directly under Boies, and jumping to Boies Schiller in 1998. Gravante was also an associate at Cravath, but left to work for criminal defense giant Jerry Shargel. He became a name partner at Barrett Gravante Carpinello & Stern, which merged with Boies Schiller in 2000. Dunn served in all three branches of government before joining Boies Schiller in 2014. She was a federal prosecutor; an associate White House counsel, and a clerk for U.S. Supreme Court Justice Stephen Breyer and Judge Merrick Garland of the U.S. Court of Appeals for the D.C. Circuit. But it’s clear that the four share a commitment to preserving the firm and its culture, which they describe as collegial and entrepreneurial.